Be ready to get out and hunt teal. They wait for no man. 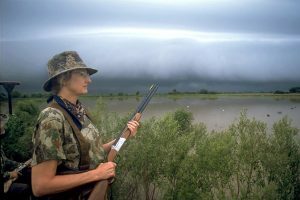 Good environmental conditions in teal’s northern nesting areas mean more birds and a 16-day early season in Texas. Blue-wings are the most abundant, and are very common to Texas early and late in the year. Green-wing teal are kind of our winter residents. And Cinnamon Teal, for the most part, are more of a western bird. They’re not real common in Texas, but we do encounter them from time-to-time. Kevin Kraai (CRY), waterfowl program leader for the Texas Parks and Wildlife, says teal do not behave quite like other duck species. One thing I like to tell hunters is these birds are actively migrating this time of year; it’s very dynamic from one day to the next. So, just wake up and go. You never know if today is the day that the migration is going to be strong. You can go out one day and there will be nothing, and go out the next and be covered up in them. So, I just say wake up and go. Find good shallow habitat, shallow water that has abundant food. And there’s a really good chance there’ll be teal there that day. The season opens Saturday, September 15 and closes Sunday, September 30, with a six bird daily bag limit. We haven’t looked this good in a long time. Right now we have abundant freshwater, from the Texas High Plains in the panhandle, all the way down to the Texas coast. Find more hunting information on the Texas Parks and Wildlife website. This entry was posted on Friday, September 7th, 2018 at 12:00 am	and is filed under Duck, Hunting, Teal. You can follow any responses to this entry through the RSS 2.0 feed. You can skip to the end and leave a response. Pinging is currently not allowed.